When looking to hire a team of pros to give you a hand with the cleaning chores, let us from Pro Cleaners Uxbridge be the first company you contact. We have an excellent reputation mainly because we never fail to offer our clients cost-efficient cleaning services in Uxbridge. We are a registered, renowned and fully insured company so if you put your trust in us you will be rewarded with an effective cleaning solution that is tailored to your needs, budget, schedule and expectations. All of our professional cleaning services are a planned and carried out by highly motivated and skilled cleaners. Therefore, we do not shy away from full home or office cleaning jobs. We can organise them on regular or on a one-off basis. As our client, you can also hire us to clean just a particular area in your home or even just to sanitise a single furniture piece or an appliance. That is because our range of services includes the cleaning of carpets, rugs, ovens, upholstery furniture and more. We are well aware that to meet all the needs of our customers, we first and foremost need to provide them with the highest level of convenience and flexibility possible. For that reason mainly, our clients can easily combine two or more of our insured cleaning services. With us by your side, you will not be forced to pick between just one or the other. Instead, you can book us for a number of cleaning projects at the same time. By doing so, you will also get access to some of our special deals. For instance, you will automatically get a 50% price cut if you hire us for an end of tenancy cleaning and a carpet cleaning. You can even combine services which fall into one the same category and still enjoy a generous discount. Such will be the outcome for you if you book us for the cleaning of a hot extractor and a single oven. Do that and we will only ask you pay a total price of only £75. The only thing that is more flexible than our offers is our schedule. Our trained and polite cleaners are ready to offer you a helping hand from Monday to Sunday. Some of our clients choose to make an appointment for a weekend or after regular office hours due to their own busy schedule and you too are welcomed to do that if you choose to. Any day is a workday for us. The starting price of each of our trusted cleaning services is affordable. For example, our end of tenancy cleaning kicks off at only £87, while our regular domestic cleaning – at just £9.5 per hour per cleaner. The next step for you would be to get in contact with us. 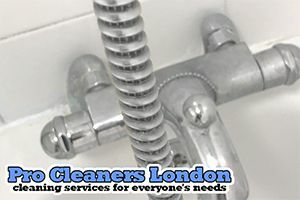 We, from Pro Cleaners Uxbridge, have a special 24/7 client support line. If your preferred form of communication is email, you can reach via email too. We will provide you with a free quote and the most comprehensive cleaning services in Uxbridge. Your workers are fast. They arrived on time and in a couple hours, had the entire house cleaned. Amazing! – Mary J. There were several old runner carpets in our hallway that were beginning to show their age. We were about to toss them when my husband suggested we call you. They look almost new. Thanks! - Celine L.
The upholstery in my husbands study was very old, and starting to smell of cigar smoke. Your staff pre-treated them, and in under an hour, they looked brand new. The rooms smells a lot better now. – Frank P.
We serve Greater London and the South-East of England. Pro Cleaners London is ranked 5 out of 5. Based on 3 user reviews.